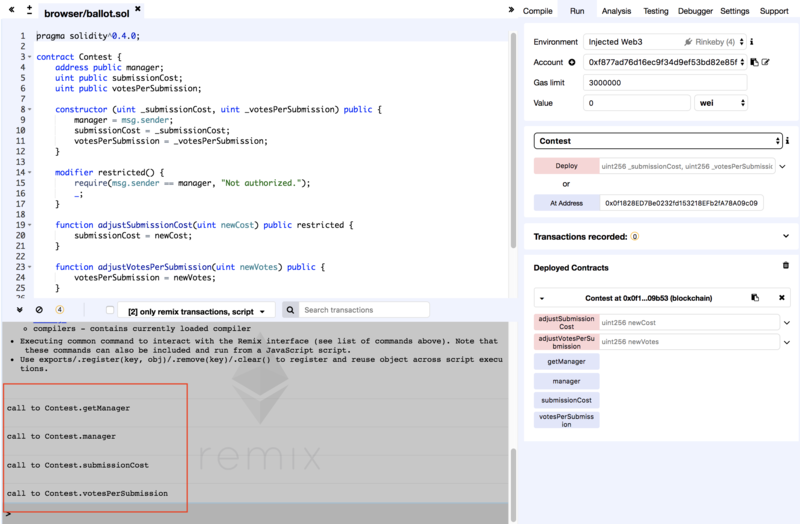 I have deployed a very basic solidity contract (pragma solidity^0.4.0) to Rinkeby. When I call the getters on my state variables, nothing is returned and I do not understand why. To compile the contract I'm using "solc": "^0.4.25"
Using Remix to test, the call to the getter works locally without issue. However, the call doesn't work on my contract on Rinkeby. When calling any of the public variables from Remix, I expect a return value, however I only receive the message call to Contest.manager in the Remix console and nothing more. I have finally solved this mystery. The cause was my metamask chrome extension being out of sync. Therefore, my dapp and remix wouldn't actually make the call to Rinkeby because metamask was blocking it. The fix was simply to reinstall the metamask extension! I quickly tested and complied your code on remix, at 0xacBd19113e0D8122E18DF48A320b635fB5D7Cdd0, I was going to make a transaction, but looks like I'm unauthorized. On a unrelated note, somehow all my rinkeby eth is gone :(. As for your other behaviour that you are seeing in your dapp, it's hard to know what the reason is. I assume that if you were to console.log the return value, you should end up with some value and that should be enough for you to either ask more questions and/or debug your code. Not the answer you're looking for? Browse other questions tagged solidity remix rinkeby or ask your own question.